Craftster Community > KNITTING > Knitting: Completed Projects > Face warmer? Surgical mask? A link to a free pattern. Re: Face warmer? 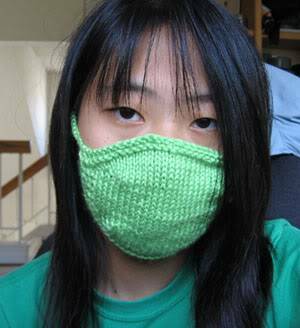 Surgical mask? A free pattern. Whee. <3 to Caron Simply Soft. My gauge is off. Its slightly too small, but I don't mind too much. instead of knitting the straps, i just crocheted a chain. It seemed easier. woooo hooooo, you got that scrubs look goin' on! Hi! Sorry to bump this after so long, but I missed all the later versions of the mask. Nice knitting, craft ninjas! I'm bumping too! I've had this idea in the back of my mind, but it never came to fruition. Thanks so much!. The reason I want it is b/c I'm a runner, but I have asthma. I always do better when I have something over my nose that slightly warms the air. Cold air shocking my lungs will trigger an attack. I use scarves but they come loose and I won't spend the money on a professional warmer-thingy. I love this!!!! http://www.easypeas.com - "Your dinnertime solution"
I am making one for my mom for Xmas! You need to submit this to Knitty. Wow! I agree with the other winter bikers who posted. This looks like it will solve the problem I always run into with my helmet straps getting in the way when I pull my neck gaiter over my face. Has a fetishy feel..especially if it was done in lace. I am a highschool graduate, and this was posted when I was in 7th grade, is it sad how long I've been lurking? my real comment, I just finished my first of these masks, I'll post a picture later. It's a wonderful solution to my perpetually cold in winter nose problem. It took a failed attempt to get the one that fits perfectly, but I've never made anything more complicated than a scarf and I was being helped by a mom that doesnt know how to knit. So not too shabby. And it matches my new red trenchcoat, yay happiness! This is the best Idea I've seen in a while. I have sensitive skin and live in a very windy area- I always end up with rashes and windburn all around my mouth. This looks like it could be very helpful- thanks for the pattern! I love this! I have a thing for surgical masks and this was a great idea! Great job! !